Apple on Wednesday unveiled the latest version of its iLife software suite, with the 2011 edition including new versions of three included applications: iPhoto, iMovie, and GarageBand. 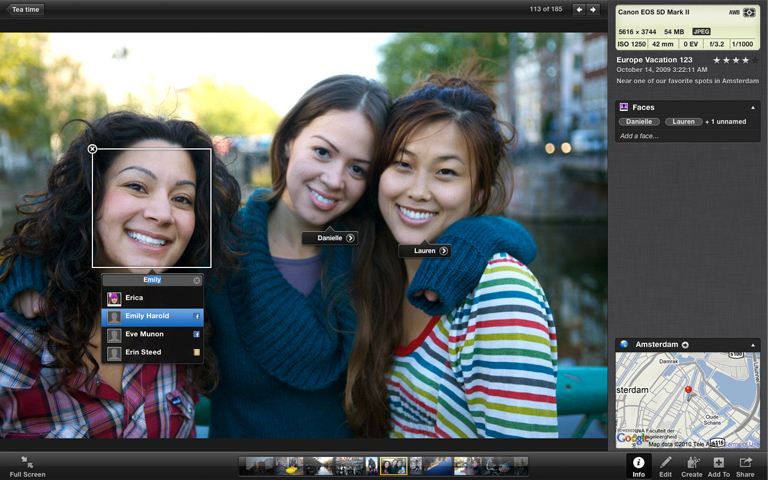 As with previous versions, iLife '11 is included free with every new Mac. And for users who want to upgrade, it's just $49, and available today. "This has got to be some of the highest value software in the world," Apple Chief Executive Steve Jobs said. 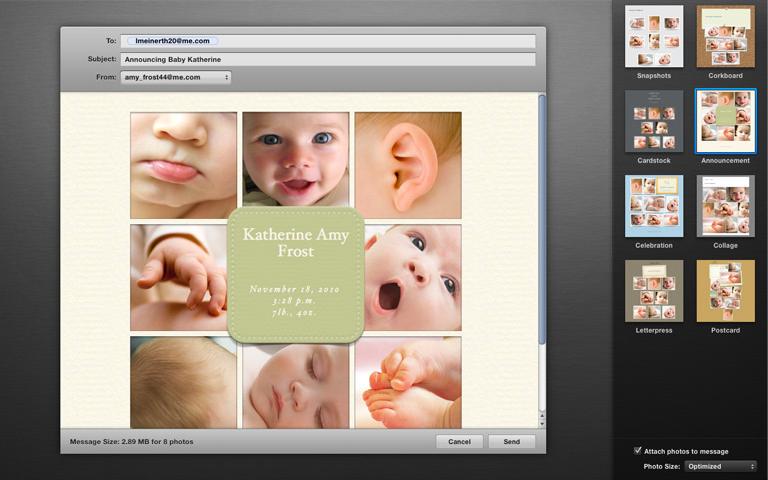 Apple noted that iPhoto '11 has a whole new look, with full screen modes for Faces, Places and Events. 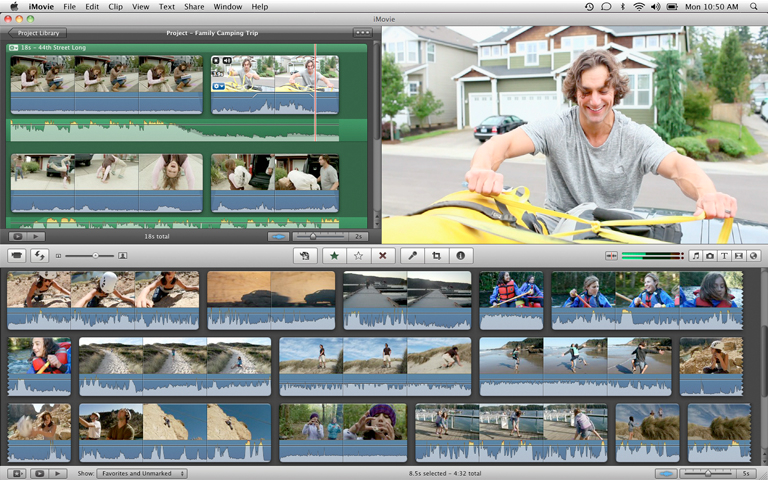 iMovie '11 aims to make it easier than ever to edit videos and quickly transform them into fun theatrical trailers for easy posting online. 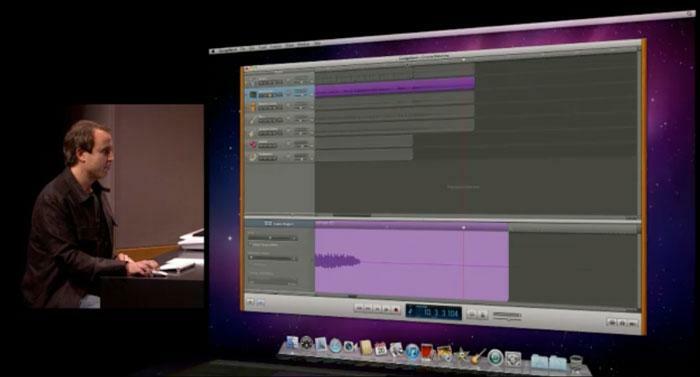 And GarageBand '11 introduces new ways to improve your playing and create great sounding songs with Flex Time and Groove Matching. "iLife is widely regarded as the best suite of 'Digital Life' applications in the world, and iLife '11 makes them even better," Jobs said in a press release. "iLife now makes it easier than ever to create books and letterpress cards, make amazing movie trailers from your personal videos and post them online, and make your band sound far better or teach yourself piano or guitar." Phil Schiller, senior vice president of worldwide product marketing, demonstrated creating slideshows with new themes, sending photos via e-mail from within iPhoto, and the ability to download snaps from a Facebook account. He also demonstrated "powerful" new capabilities that allow users to automatically create a photo book with minimal user input. The presentation also included a video that shows new "Letterpress" cards that allow paper to first be indented in a press, and then filled in with colors via a digital printing process. It also used a broader full-screen mode, which Jobs said allows users to "live in full screen." Projects are also kept on a bookshelf that looks like iBooks on the iPhone and iPad. 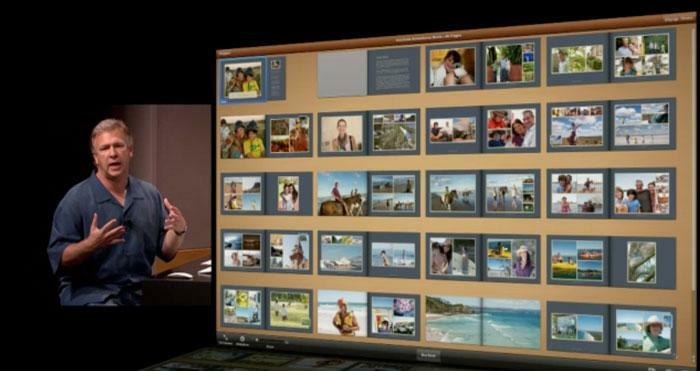 Apple said iPhoto '11 features stunning new full screen modes that take advantage of your Macs brilliant display for browsing, editing and showcasing your photos. Sharing your photos is easier than ever in iPhoto 11, whether you send them by email using one of eight beautiful themes, post them to your Facebook wall with a single click, or play them in full screen with one of 12 professionally designed slideshows. 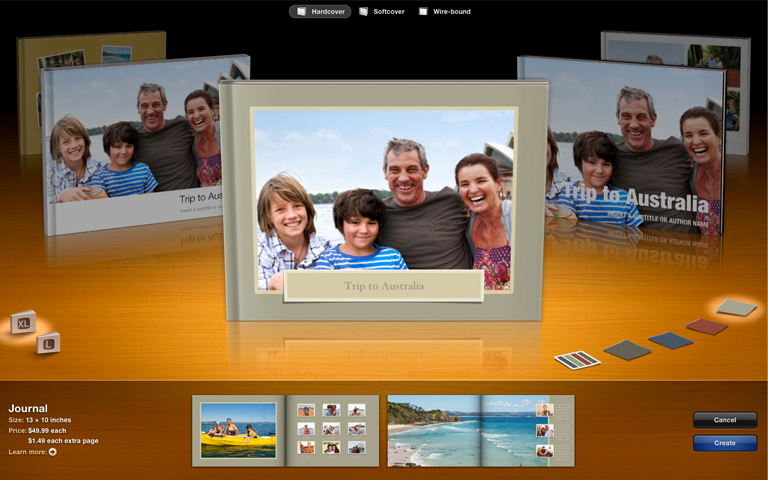 iPhoto '11 features a completely new approach to creating books and cards with a sleek carousel interface, intelligent book layout and a bookshelf that displays all your projects. New letterpress cards let you combine your photos and text with elegant imprinted designs to create unique wedding invitations, birth announcements, holiday greetings and more. Movie trailers with "almost no effort," Jobs said. 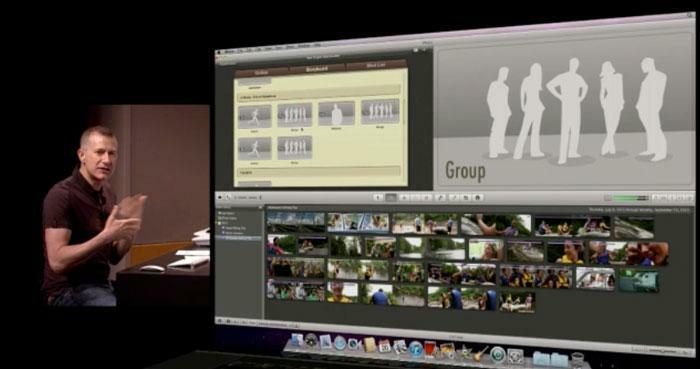 A demo was used to show off how the new version of iMovie allows users to easily make changes to audio levels and add effects. Sections of audio can be selected and heightened or lowered, for example, if it is too soft or loud. The new Movie Trailers feature allows users to make their own mock trailers, including a title, cast and credits. Clips can also be given a cinematic feel with a new 24 frames per second mode. 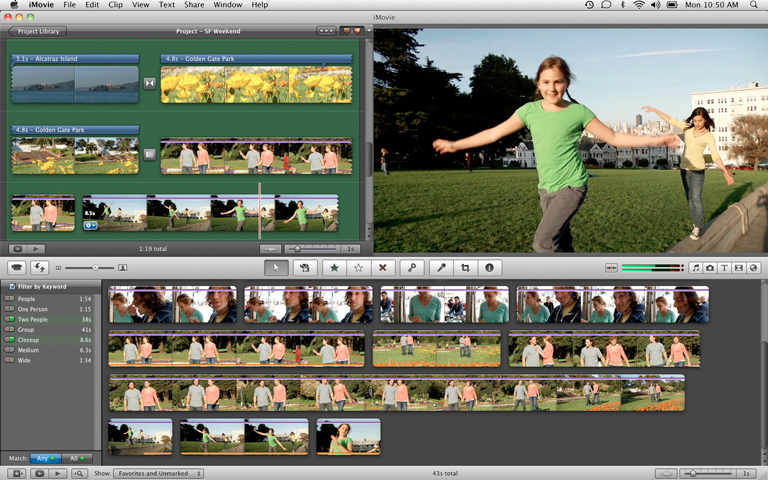 Apple said iMovie '11 helps you turn your videos into captivating Hollywood-style trailers that are fun to watch and share. You can choose from 15 different genres including Adventure, Romantic Comedy and Epic Drama, each one complete with its own unique titles, graphics and cinematic soundtrack. Powerful new tools make it easy to selectively adjust audio levels and apply sophisticated visual effects like flash and hold, instant replay and jump cuts with a single click. People Finder analyzes your videos and marks sections containing faces, so you can quickly find the perfect clips for your trailer or movie. 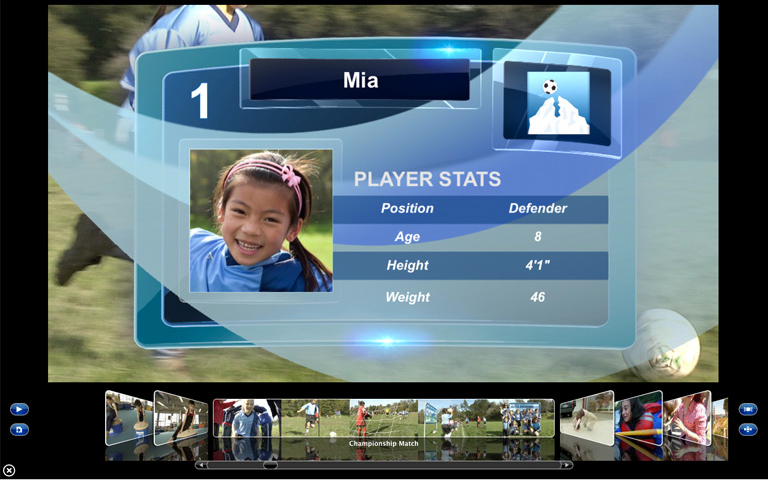 iMovie '11 also adds exciting new themes that make your videos look like professional news or sports programs. New piano and guitar lessons. New feature: "How did I play?" Demoed on stage was Groove Matching, called "like an automatic spell checker" for syncing up instruments according to a beat in GarageBand. Flex Time can also take individual recordings and drag them out to extend sounds. 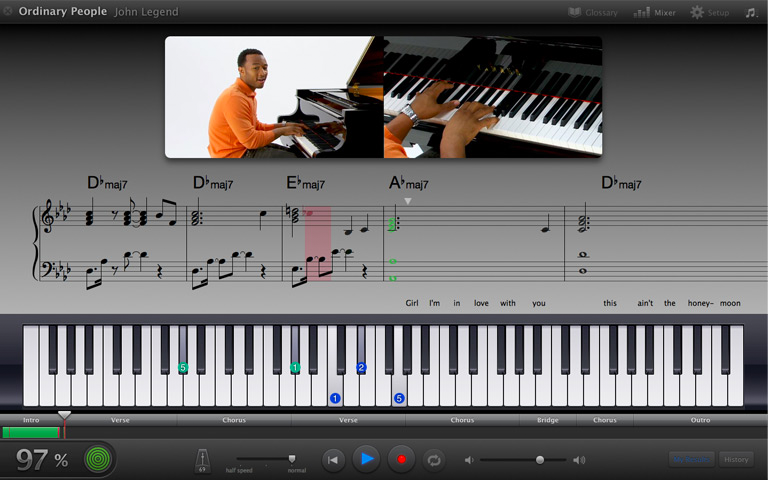 New piano lessons will also rate in real time how a user is doing. A percentage in the bottom left hand corner shows how accurately a piano performer has played a particular song. The feature also works with guitar. 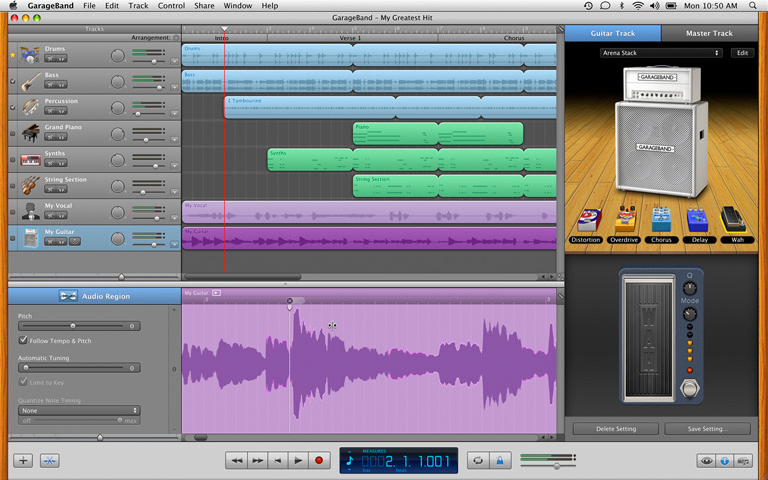 Apple said GarageBand '11 includes two new ways to fix or change the timing of your recordings. Flex Time lets you move, stretch or shorten individual notes by clicking on just the part of the audio waveform you want to change, without affecting the rest of the recording. With Groove Matching, you can select any track as the Groove Track and all other tracks will instantly match its rhythmic feel. GarageBand 11 adds seven authentic-sounding new guitar amps, five fun new stompbox effects, and 22 new Basic Lessons for piano and guitar. The new How did I Play? feature listens while you play along with any lesson, highlights mistakes and tracks your progress to help you become a better musician. 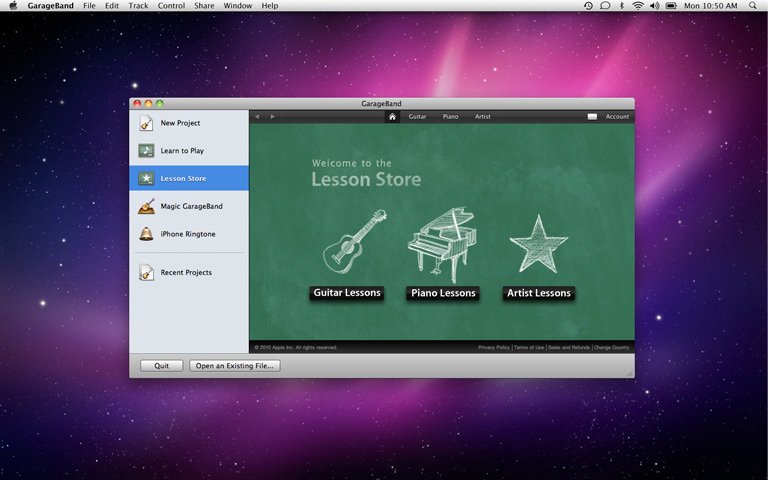 iLife '11 is available beginning today for $49.00 in single license form, while the Family Pack costs $79.00. It's also available as part of the new Mac Box Set that includes Snow Leopard and iWork '09 for $129.00 ($179.00 for the Family Pack).